Gravity and scalar fields: live long and prosper? Large panel: Ulrich Sperhake and Emanuele Berti under Isaac Newton’s famous apple tree at Woolsthorpe Manor that (allegedly) started it all. 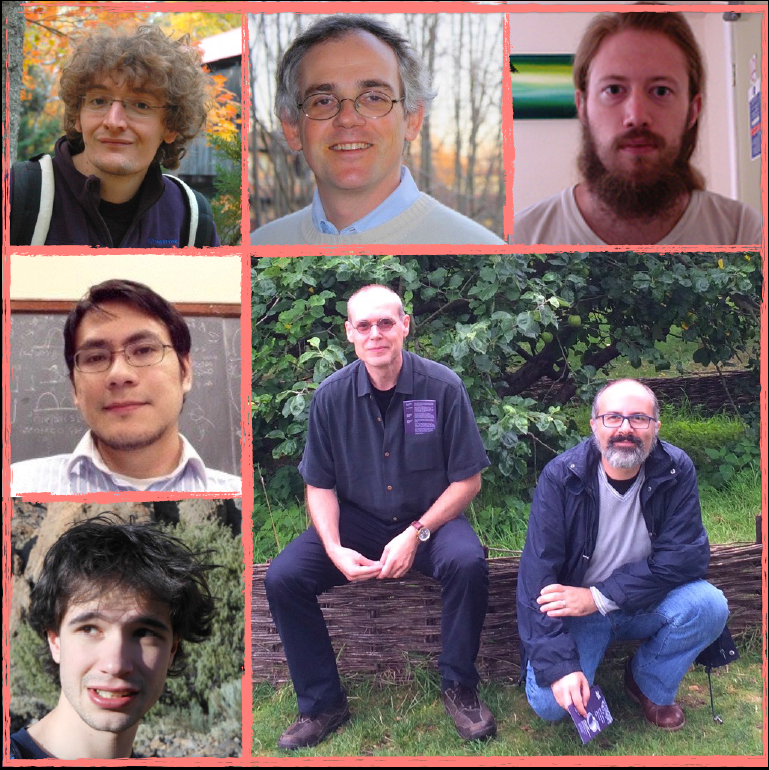 Clockwise in the small panels: Davide Gerosa, Hector O. Silva, Paolo Pani, Leonardo Gualtieri and Michael Horbatsch. Newton’s theory of gravity was a spectacular achievement: for about two centuries, a simple law based on empirical observation was a perfect explanation for the behavior of gravity throughout the Solar System. Some cracks in this perfect edifice emerged around 1840, when François Arago, the director of the Paris Observatory, suggested to the French mathematician Urbain Le Verrier to study the details of Mercury’s orbital motion around the Sun using Newton’s gravity. Predictions from Le Verrier’s theory famously failed to match the observations. Mercury’s perihelion advances each time it orbits around the Sun. Most of the perihelion precession could be explained as due to the pull of other planets, but observations and predictions differed by the small amount of 43 arcseconds per century. Le Verrier postulated that this disagreement could be explained by the presence of a small planet inside the orbit of Mercury. He must have been a Star Trek fan, since he proposed the name “Vulcan” for this object (more seriously: Vulcan was the Roman god of fire – an appropriate name for a planet so close to the Sun). Similar work by Le Verrier had recently led to the discovery of the planet Neptune using the same techniques, so it was plausible that another planet should explain the observed deviation. Astronomers kept looking for Vulcan, but nothing was ever found. Of course we know the end of this story: Newton’s gravity is only an approximation to a more fundamental theory, Einstein’s general relativity. When Einstein found that his theory predicted a deviation of precisely 43 arcseconds per century, he famously had heart palpitations. Fortunately both Einstein and his theory “lived long and prospered” (in the words of a famous Vulcanian). Today we are in a remarkably similar situation. Cosmological observations are not compatible with general relativity unless we postulate the existence of entities that we call “dark matter” and “dark energy”, which seem to interact only gravitationally. As Feynman often remarked, giving a name to something (even if it’s a cool name, as in the case of Vulcan, dark matter and dark energy) does not really mean that we understand it. In high-energy physics, a fundamental scalar field (the Higgs boson) was hypothesized to give masses to standard-model fields without breaking gauge symmetry. The existence of the Higgs boson has been spectacularly verified at the Large Hadron Collider. Similarly, it may be that dark matter and dark energy can be explained by adding extra fields to Einstein’s gravity. The simplest option is to add one or more scalar fields. In fact, there are good reasons to believe in the existence of fundamental scalar fields propagating the gravitational interaction. Many proposals for introducing scalars (e.g. axions, scalar superpartners) have solid theoretical foundations, usually related to naturalness problems. Scalar fields also arise in the low-energy limit of higher-dimensional theories of gravity. More phenomenogically, the addition of scalar fields can be seen as the simplest way to construct a well-posed, mathematically simple theory that is a smooth deformation away from general relativity. Tensor-multi-scalar theories were studied in 1992 by Damour and Esposito-Farèse in a famous paper published in Classical and Quantum Gravity [1992 Class.Quantum Grav. 9 2093-2176]. In our paper we extend their work in two ways: (1) we specialize the theory developed by Damour and Esposito-Farèse to a simpler and more tractable model with two scalar fields, and we study some key properties of relativistic stars in this model; (2) we write down the theory in a 3+1 form, that should be useful for fully numerical evolutions. An important motivation for our work comes from gravitational-wave detectors such as Advanced LIGO and Virgo. Soon after their work on tensor-multi-scalar theories, Damour and Esposito-Farèse showed that scalar-tensor theories with a single scalar can be indistinguishable from general relativity in the Solar System, but at the same time produce large deviations from general relativity in neutron stars, and therefore in binary pulsars or compact binary mergers (such as those detectable by Advanced LIGO/Virgo). This is due to a phase transition that they called “spontaneous scalarization”, in analogy with “spontaneous magnetization” in ferromagnetism [Phys.Rev.Lett. 70 (1993) 2220-2223]. Binary pulsar observations are much better today than 20 years ago, and they have set very stringent constraints on the original mechanism involving a single scalar field. If spontaneous scalarization occurs at all its effects should be mild, and it is quite unlikely that it will produce observable deviations from general relativity in the Advanced LIGO/Virgo band. In our paper we show that a theory with two or more scalars – having more degrees of freedom – gives rise to a richer phenomenology, with potential signatures for gravitational-wave observations. If the theory allows for spontaneous scalarization, the deviations from general relativity will be much stronger in proximity of the merger. This “dynamical scalarization” idea was recently studied by various groups in theories with a single scalar. In this paper we compute the first neutron star models in tensor-multi-scalar theories, and we identify similarities and differences from previously known models involving a single scalar field. We also write down the equations for tensor-multi-scalar theories in a 3+1 form, ready to be used in numerical relativity evolutions. We hope that this first exploration of the uncharted map of neutron stars in tensor-multi-scalar theories will stimulate numerical groups to look for “dynamical multi-scalarization”. If phenomena of this kind are observed in the gravitational-wave signal, they may give us important hints on how to modify gravity in the ultraviolet (strong curvature) regime, where problems with quantization (and the singularity theorems by Hawking and Penrose) suggest that the classical theory should not apply.